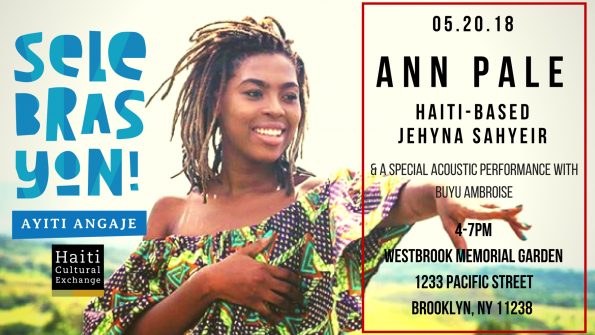 Join us for an afternoon of music and conversation with Haiti-based singer Jehyna Sahyeir in collaboration with Brooklyn Queens Land Trust. Jehyna Sahyeir (HaitiXNY Artist) is an emerging singer, actress, and spoken word artist based in Haiti. She has presented with Haiti-based collectives and organizations: Feu Vers, Pyepoudre Cultural Center, and FOKAL; performed with renowned artists such as James Germain and Erol Josué; and has participated in Carifesta XIII in Barbados and Rencontres Québécoises. She embarks on her solo career with her first performance in New York, as part of Selebrasyon! This entry was posted on Thursday, April 12th, 2018 at 2:27 pm	and is filed under An n' Pale, Archive, Selebrasyon!. You can follow any responses to this entry through the RSS 2.0 feed. You can leave a response, or trackback from your own site.